drinkboston.com » Blog Archive » Shaken or Stirred? This post also appears on the LUPEC Boston blog as a companion piece to an article I wrote for the LUPEC Boston cocktail column in the latest Weekly Dig, which will be out in print tomorrow. Which cocktails should be shaken and which ones should be stirred? If you’re a student of classic mixology, you might answer, “That’s easy. Drinks with eggs, dairy or fruit juices should be shaken, and ‘clear’ drinks made with only spirits, vermouth, etc. should be stirred.” OK, the first of those mandates is seldom disputed. Stirring an egg drink? Not gonna work. But shaking a Martini? James Bond has some surprising company here. That consensus still holds in, like, 99 percent of modern bars. Most drinkers like the theatricality of a shaken drink, and most bartenders are happy to oblige, especially since it’s easier for them to employ only one mixing technique. Sure, your Grey Goose with olives will be cloudy with air bubbles, but it’ll be drinkable. Is “drinkable” good enough when you’re paying $10-$15 for a cocktail? If you gravitate toward clear mixtures, as I often do, the answer is probably “no.” There’s something about a Martini, a Manhattan, a Saratoga or a Gin and It that has been deftly swirled over ice for a good minute, then strained into a chilled cocktail glass without a trace of agitation. What you get is a shimmeringly transparent drink that looks and tastes that much more elegant than its shaken sibling. And consider this: a bartender who takes the time to stir a cocktail is likely going to get its proportions and temperature right, too. Time to re-think your drink, Bond. Agreed that a transparent cocktail looks beautiful in the glass. Agreed also that it might taste better. Can you really taste those tiny bubbles? And some people claim that a bit of agitation adds some texture to the drink and it’s actually a good thing; I’m not sure one way or the other. Jeez, Adam! While a properly proportioned martini is one of the most elusive of humankind’s pleasures, surely you’ve found a bartender or two out there who does it right. And don’t knock the olives. Since when did we have to abandon olives in a “proper” martini? Lauren: I haven’t ordered too many martinis in bars; when I find a good bartender I generally prefer to order a drink with a bit more flavor (why order a martini if I can drink a Last Word?) … but I do like the occasional martini, and I make it myself with 2:1 gin:vermouth ratio, two or three dashes of orange bitters, and a twist. The twist, I think, gives the martini a nice crisp/bright flavor, as opposed to the olive which just adds a bit of salt. I have tried ordering martinis with “extra vermouth” and I usually just get a weird look. And orange bitters? Forget about it! Maybe now that the Angostura Orange is out that will change. By the way, I finally managed to get a bottle of those bitters today, and in honor of this post stirred up a martini with a few dashes. Awesome stuff! Zesty, with a bright orange flavor that reminds me of Cointreau… a tasty addition for my martinis! As a follower of Embury, I go by what he says…”(Eye appeal), A substantial part of the charm of certain cocktails such as the Martini and the Manhattan is the clear, almost scintillating translucence. A stirred cocktail will remain clear; a shaken cocktail will be cloudy or even muddy in appearance….Some people care more for the stinging cold of the shaken cocktail than they do for its appearance. So, if you do not mind a muddy-looking drink shake to your heart’s content. (Embury 108). Well put and I would agree. A 30’s Manhattan in a chilled glass will do it for me. … but is that just a second name for what is really a Martini? CocktailDB does not seem to have any drinks called “Martini” that use these ingredients, but check out “The Savoy Cocktail Book”, page 62, and you will find a “Dry Martini Cocktail” containing gin, French vermouth, and orange bitters. You can also find the Astoria on page 24, which is the same as the Dry Martini but with a different gin:vermouth ratio. As an aside, Cradock also specifies that a stuffed olive should be used to garnish the Astoria; no garnish is mentioned for the Dry Martini in Savoy. Another reference found in “Imbibe” by David Wondrich: Page 247 includes a Dry Martini recipe credited to Charlie Mahoney, “Hoffman House Bartender’s Guide”, 1906, which uses the same 50:50 gin and vermouth ratio, plus a dash orange bitters and an orange peel squeezed over the top. I’m surprised no one has raised the distinction I was taught: always stir if the drink contains bitters, which will make the drink cloudy if shaken. I now guess this refers to non-potable bitters: my Negronis never get cloudy and I always shake them. Most bartenders aren’t stirring, of course, because it takes too long. I’m always impressed when someone knows enough and is willing to take the time to stir my Manhattan (as, for instance, they always do at the B-Side Lounge in Cambridge) for this reason. You freeze your gin (or vodka) in order so that the shaking of it with ice doesn’t melt the ice too much, thus watering down your drink. With a room temp gin, the ice melts too much, watering down my precious Bombay Sapphire. As for vermouth, I dunno. Even with the little bit I use, if it isn’t Noilly Prat I can really tell the difference. So it must add something. I’ve never tried orange bitters in the martini. My wife, a true purist, would never do it, but I might some night. Another ingredient to try, recommended by the bartender at Zygomates, is the elderberry flower liqueur. Personally, I’ve spoiled myself with my martinis and they are never cold enough nor dry enough at a bar, so I usually try something else like a sidecar. Might want to read up on CocktailDB before you bash it. “American Bar”, Frank Newman, 1904. Martini, page 66, w/ orange bitters. No Astoria cocktail listed. “New and Improved Bartenders’ Manual, 1934 Edition”, Harry Johnson. Martini, page 165, w/ Boker’s bitters. Again, no Astoria cocktail listed. “The Cocktail Key”, listed as published in the 1920s. Martini listed, again, with orange bitters. “Bariana”, 1902, Louis Fouquet. No Astoria listed. Martini listed with orange bitters, in addition to absinthe and Creme de Noyaux. (I think there are page numbers but I’m having a lot of trouble reading them). … based on these six sources, plus the other three books I’ve already quoted, I think we can safely conclude that the original Martini formulation did indeed have bitters. As for the Astoria, we can’t draw many conclusions from lack of evidence, but it seems that if it did predate the Martini it was certainly not as widespread or well-known a drink. Wow, fellas. My head is spinning. I need a Martini — lemon twist, olives, frozen gin, orange bitters, elderflower liqueur… whatever. You want EXTRA Vermouth? Girl! you are ruining the smooth taste of the vodka!! 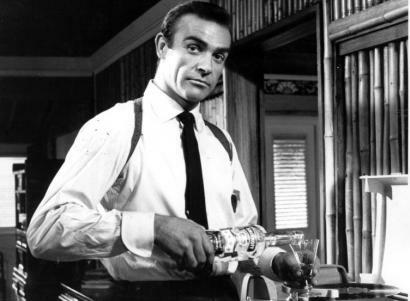 If I do the Vermouth…….I pour just a little in the martini glass and then throw it out! Vodka from the freezer (only the best) poured into a martini glass which has been wet and put in the freezer for the coldness! 3 olives and I’m done.